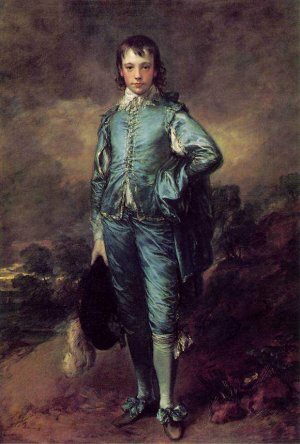 The painting of The Blue Boy is perhaps one of the most well known works by Gainsborough (GAINZ burro). It is thought it is a picture of Jonathan Buttall, who was the son of a wealthy hardware merchant. It is painted with oil paints on a canvas and is quite large; 48 inches wide and 70 inches tall. He painted it over another painting he had already started to paint. 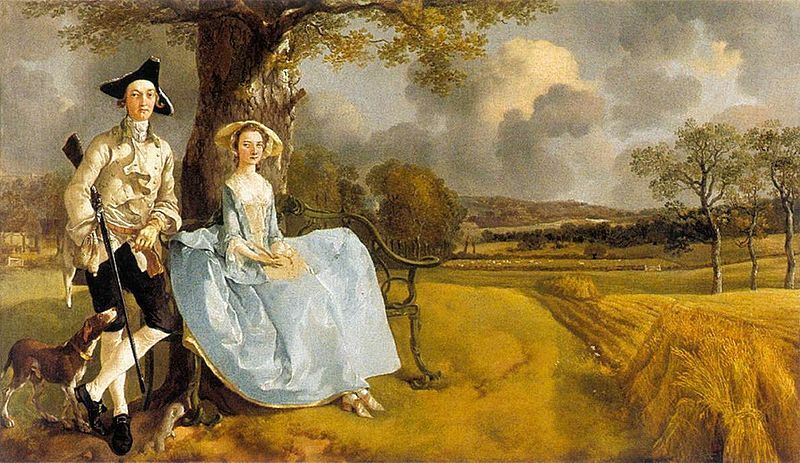 Thomas Gainsborough was born in England and began drawing when he was very young. He started taking lessons at the age of 13. It is said he once sketched a thief stealing from the Parson's garden so accurately, they recognized him as a man from the next village. The culprit was apprehended. 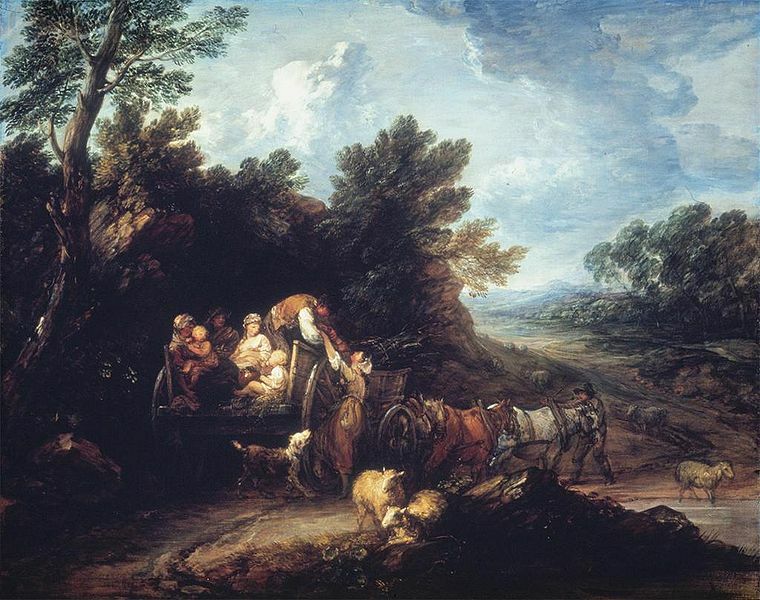 Gainsborough is noted for his portraits, but before he started doing portraits he was a painter of landscapes. He still included landscapes even in his portrait painting. 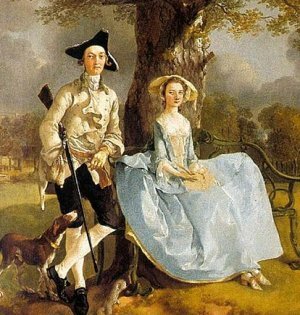 In the painting on the left of Mr. and Mrs. Andrews the landscape is as equally important as the subjects. Evidently they are the landowners, but not the ones who work the land. 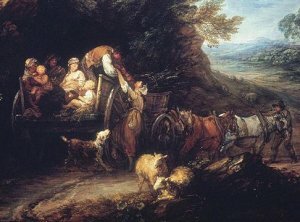 The next picture, The Harvest Wagon was painted in 1767. Notice the use of light and dark colors in the picture and the depth perception. The picture almost looks 3-dimensional. 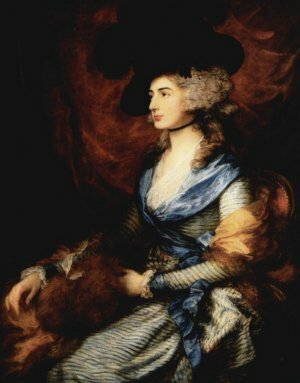 The following picture is Sarah Siddons who was a famous actress during that time. Gainsborough was one of the artists she commissioned to paint her portrait. It is said he had trouble getting her nose to look just right. He was a musician who played the viola. He once said, "I paint portraits to live, landscapes because I love them, and music because I can't leave it alone". He brought objects into his studio to include in his landscapes. Once he used a head of broccoli as his model to represent woods in a background. When he was nineteen years old he married a well-to-do woman named Margaret Burr. Her income helped him to get started as an artist. He painted many pictures in his lifetime; more than 500 paintings. About 200 of these were paintings of people. He became wealthy because the rich people wanted him to paint pictures of their families. 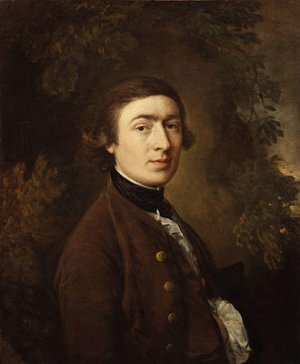 Gainsborough was noticed by King George III who asked him to paint the royal family even though Joshua Reynolds was the official court painter. This caused a rift between the two artists which was eventually healed before they died. Near the end of his life he was bothered by a swelling in his neck which proved to be cancer which would cause his death. He settled his business, got his affairs in order and died on August 2, 1788. Kostner, Thomas, and Lars Roper. 50 Artists You Should Know. New York: Prestel, 2006. Wilder, Jesse Bryant. Art History for Dummies. Hoboken, NJ: Wiley Publishing Inc, 2007. Nichols, John, and Samuel Bentley. Literary Anecdotes of the Eighteenth Century. London: Nichols, Son, and Bentley, 1815. I have a picture of blue boy that has been a center. Of a lot of weird activity. Just curious if I'm the only one. It is an oil canvas painting that has a couple runs that looks. Like tears. I have a picture of Blue Boy and Pinkie, are they worth anything? Absoulutely truly amazing & gorgeous. Boy Blue by TG recaptures my childhood fantasies, as our painting in our living room. This page displayed 180,363 times.